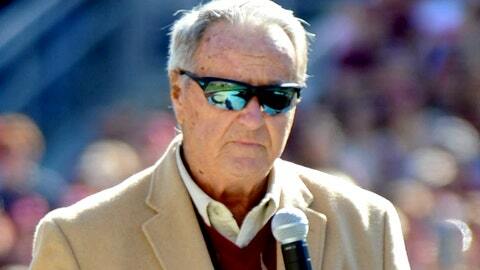 Former Florida State Seminoles head coach Bobby Bowden lost grandson Taylor Jeffrey Bowden in a car accident Thursday. WINTER HAVEN, Fla. (AP) — Former Florida State football coach Bobby Bowden’s grandson was one of two men killed when their car flipped into a small ditch off a central Florida road, officials said Thursday. Taylor Jeffrey Bowden, 23, and driver Rafael Fernandes De Aguiar Valim, 25, died in the crash, according to a news release from the Polk County Sheriff’s Office. A third man in the crash — 22-year-old Robert Lewis Edwards — was rescued after spending hours in water up to his neck. 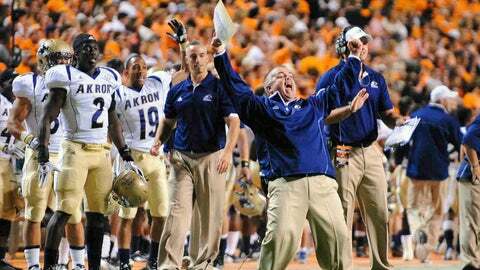 "Our whole family had just celebrated Christmas together in Panama City, as well as celebrated T.J.’s graduation from Florida State just three weeks ago," Bobby Bowden said in a statement released by the University of Akron, where son Terry is the football coach. "We will cherish those last memories together with T.J. forever." T.J. Bowden was the son of Jeff Bowden, a former Florida State assistant coach under his father who is now on brother Terry’s staff at Akron. "I can’t express the grief I feel right now," Jeff Bowden said in a statement. "Please keep us in your prayers." A trash collector reported the submerged car at 7:47 a.m. The Mitsubishi wasn’t very visible from the road, but the Florida Refuse truck was high enough to allow the worker to see it. At first, Winter Haven police, sheriff’s deputies, paramedics and the sheriff’s office dive team who responded couldn’t find survivors. The front end of the care was completely submerged, while part of the back end was sticking up out of the water. More than three hours later, dive team members in the water heard noises coming from in the car. They were able to communicate with Edwards, who said he was cold and needed help. After several minutes, Edwards was out of the water and he was being treated for hypothermia and other injuries at a hospital. The dive team then located the bodies of Bowden and De Aguiar Valim. The details of the crash were being investigated, but alcohol appears to be a factor, the sheriff’s office reported. Deputies have attempted to talk to Edwards about what happened but said he wasn’t lucid. It appears that the car was heading north on Country Club Road when it cross the southbound lane, crashed through a fence, went down an embankment and came to a rest upside down in the water. Bobby Bowden led the Seminoles from 1976 to 2009. The 84-year-old holds the NCAA Division I record for career wins and bowl victories and won two national championships. In September 2004, Bobby Bowden’s grandson, 15-year-old Bowden Madden, and former son-in-law, John Allen Madden, were killed when their car was hit a by a utility truck that was helping to restore power outages caused by Hurricane Frances.